Incoherence, thy name is H.R. 3. In the case of abortion and health care, religious right organizations claim that even if individuals purchase their own abortion coverage, any tax subsidy for health care coverage that includes abortion constitutes federal funding– which is why they’re trying to pass the extreme H.R. 3 “No Taxpayer Funding for Abortion Act.” But in the case of church exemptions and school vouchers for parochial schools, these same groups argue that a tax deduction or subsidy is not a form of government funding (because if it were, it’d be a clear violation of the Establishment Clause of the First Amendment). DeLay told prosecutors that he knew that Jim Ellis, DeLay’s chief political aide in Washington, was going to exchange 190,000 dollars of corporate money for campaign donations from the Republican National Committee. “Jim Ellis told me he was going to do it,” DeLay said. “Before he did it?” prosecutors asked. “Uh-huh,” DeLay answered. DeLay, a former No. 2 House GOP leader, faces five to 99 years in prison and a fine of up to $10,000 on the money laundering charge. [District Judge Pat ] Priest allowed DeLay to remain free on bond until sentencing, which is set for Dec. 20. Travis County District Attorney Rosemary Lehmberg said no decision had been made on whether prosecutors would recommend prison time or probation for DeLay. Yes, DeLay’s attorney is talking about filing an appeal. Conservative Christian leaders are plotting against President Obama, hoping to do to him what they did to President Jimmy Carter: use their moral authority and organizations to remove a fellow Christian from the White House. According to Brian Kaylor’s exclusive news report, some 40 conservative Christian leaders met in early September near the Dallas-Fort Worth airport to keep Obama from being re-elected. Their plotting discloses a lack of moral integrity. Rather than being honest, the group met under the pretense of a prayer meeting. Meanwhile in North Carolina, there is a debate over a political speech masquerading as a prayer. Australia’s Prime Minister Julia Gillard is a “non-practicing Baptist [atheist]” who lives without benefit of matrimony with her male companion. We’re a weird mob when it comes to God and politics. Two-thirds of us tick a religious box in the census but research for the Herald by Nielsen last year found three-in-four don’t care whether our leaders believe in God. There are as many of us who abhor it in politics as there are who crave it, and both are small minorities. Macquarie University academic, Marion Maddox, whose book For God and Country details the religious dynamics in Australian politics, says “Australians are suspicious of anyone who sounds too religious.” She has also said she expects the religious beliefs of politicians to fade from public discourse. Ms. Gillard has turned around Labor’s fortunes, even in Western Australia where support had slumped to 28 per cent thanks to the mining tax. A poll in The West Australian yesterday showed support had jumped to 36 per cent in the wake of her promotion. She’s expected to call for an election soon to establish her own governing mandate. Don’t expect an American-style debate over the church she doesn’t attend. Indeed, that uproar Down Under isn’t happening already. Religious Right + SBC Fundamentalists = flight of millennials from the church? The fundamentalist takeover of the Southern Baptist Convention began in 1979. The rise of the Religious Right in America dates from the same year. While not focused precisely on the issue Prescott addresses, Michael Gerson, senior research fellow in the Center on Faith & International Affairs at the Institute for Global Engagement, made a show of discovering the relationship for himself late last year. Somewhat similarly, Tullian Tchividjian, grandson of Billy Graham, responded to the shift in public attitudes away from right-wing political zeal and turned Ft. Lauderdale’s Coral Ridge Presbyterian Church away from its hyper-political, right-wing activist heritage. Of course he had to fight off an attempt by the old hands to remove him from the pulpit there. In the necessity of that fight is one answer to Prescott’s closing question: Will those who helped bring the alienation about “ever realize“? February 26, 2010 Posted by baptistplanet | Politics, Religion	| Coral Ridge Presbyterian Church, culture wars, D. James Kennedy, millennials, politics from the pulpit, Religious Right, Tchividjian | Comments Off on Religious Right + SBC Fundamentalists = flight of millennials from the church? In my mind, there’s something about Jesus’ injunction to “let your yea be yea, and your nay be nay” (Matt. 5:37) that is applicable beyond oath-taking situations and confirms the truth that “anything beyond these is of the evil one.” Christians have no business embellishing the truth and twisting it for political purposes and that is what the Manhattan Declaration does from beginning to end. All driven by the desperation of a Christian Right which feels power slipping through its fingers like sand. Will Gingrich surf his way of the cross to the White House? Newt Gingrich is on a spiritual journey back to power in the Republican Party and perhaps a run for president. Gingrich was a Southern Baptist, but had previously followed a brand of New Age philosophy, according to Milbank. Matt Bai looked at Gingrich’s resurgence in New York Times Magazine. Bai describes a Republican retreat for congressmen in Virginia earlier this year, where Gingrich was the keynote speaker. Gingrich told inspiring stories from history and sports and even lightheartedly referred to himself as Moses, saying he’d help the GOP cross the Red Sea again only if it stayed on the other side. Gingrich spoke at a conference in June that shares the book’s name, according to a post by Dan Gilgoff in the U.S. News and World Report’s God & Country blog. Gingrich is positioning himself to ride that wave. 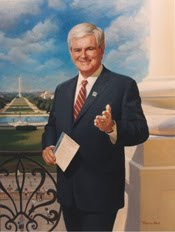 November 12, 2009 Posted by baptistplanet | Politics, Religion	| Catholicism, Gingrich, Religious Right, Republican Party, Southern Baptist | Comments Off on Will Gingrich surf his way of the cross to the White House? Sarah Palin, queen of oogedy-boogedy, recorded a Va. robocall, mostly about herself. She also endorsed the New York 23rd District Conservative Party candidate, turning that race on it’s head. In April conservative columnist Kathleen Parker was mulling the obituary of the Religious Right – the oogedy-boogedy branch of the Republican Party. And tomorrow, very much alive, they’re likely to romp here and there. From Virginia to New York to Maine, the religious right is playing a key in tomorrow’s off-year elections. The reports of its death were greatly exaggerated. Every other election cycle or so, the religious right makes noises that it might have to form a third party of its own. Although the likelihood of success for Christianist third party is nil, this “values voters” grandstanding is not an empty threat. It moves GOP candidates, particularly in the primaries, to the right. They can’t win without the Christian right money or ground troops. She then conducts a tour of races in which the Religious Right has imposed its will, most notably in NY-23 where, win or lose, Sarah Palin & Co. ejected a Republican moderate and put a Conservative Party candidate in the lead. They’re not the same, but the search for a redeeming new name isn’t on the minds of the prevailing Religious Right leaders tonight. That doesn’t mean they’re really back in electoral charge, however. It means they aren’t dead. Did someone seriously think they would be dead? They have long made their political living by manipulating a target audience they know well and they are, of course, still good at it.